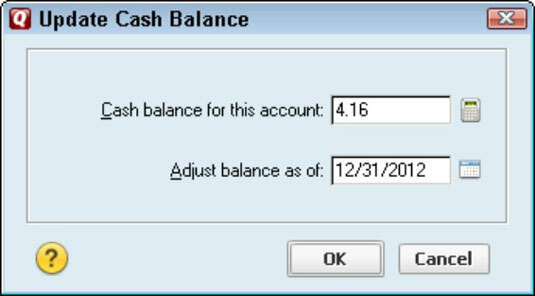 You can adjust the cash balance in a Quicken 2012 brokerage account and the shares balance in brokerage accounts if for some reason the figures are incorrect. How you adjust the cash balance in a brokerage account depends on how you set up the account. To adjust an investment account’s cash balance, when the cash balance information isn’t tracked in a separate linked cash account, click the investment account’s name on the Accounts bar, click the Account Actions button, and choose Update Cash Balance. When Quicken displays the Update Cash Balance dialog box, specify the correct cash balance and the date as of when the figure you enter is correct. To adjust an investment account’s cash balance (or cash management account, as some brokerage houses call them), click the account name on the Accounts bar, click the Account Actions button, and choose Reconcile An Account. You reconcile a brokerage cash account the same way you reconcile a regular old checking account. Reconciling a brokerage cash account works the same as reconciling a bank account. To adjust the shares balance for a security in a brokerage account, click the brokerage account on the Accounts bar, click the Account Actions button, and choose Update Share Balance. 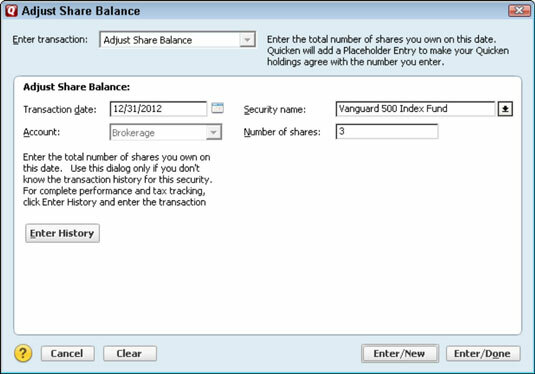 Quicken next displays the Adjust Share Balance dialog box, where you specify the security, the correct number of shares, and the date for which you’re entering the balance. Fill in the text boxes and then click either Enter/New or Enter/Done. Quicken adjusts the shares balance for the security you specified.